Green Ronin has done a good amount of charitable giving over the years. This has generally been on an ad hoc basis though, with us either reacting to disasters like the earthquake in Haiti or taking opportunities that came our way, like the Worldbuilders fundraising event at Emerald City Comic Con last year. Things feel different in 2017 though. It’s like we’ve all moved into a darker timeline, with forces thought vanquished in WWII coming back to haunt us again while a dangerous instability affects America and the world. We’ve thus decided to be more active in our charitable giving. We’ve set up a page on our website about it, so you can see what we’ve done and keep up on what we are doing. Starting now we will also be having a sale in our online store each month that benefits a different charity. We will use these sales to highlight organizations doing good and important work that can help us all weather the coming days. Our February sale will benefit the Union of Concerned Scientists. This a group founded in 1969. To quote their website: “Appalled at how the U.S. government was misusing science, the UCS founders drafted a statement calling for scientific research to be directed away from military technologies and toward solving pressing environmental and social problems.” Things were bad then. They are far worse now. Science and indeed the scientific method are under assault. This is short sighted to say the least, and the effects on America and the world may be dire. 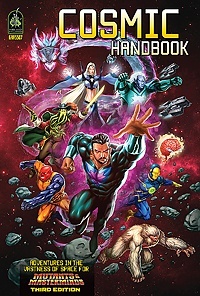 We are putting The Cosmic Handbook on sale for $19.95 in print and $12.95 in PDF this month. $10 of each sale will go the Union of Concerned Scientists. Thank you for your support.